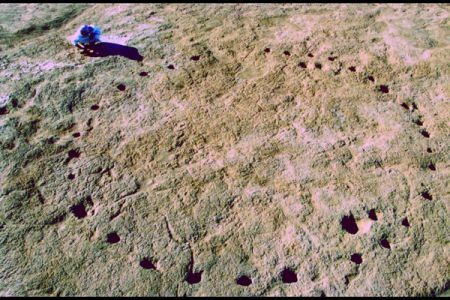 Pre-Kerma develops between the end of the fourth and the beginning fo the third millennium B.C. It bears witness to an important social complexification, foreshadowing the formation of the first kingdom of Sub-Saharan Africa. 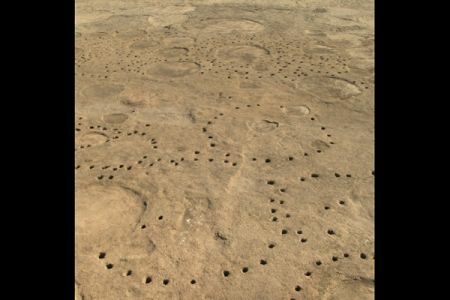 The period that covers the fourth and third millennia is ill known in the Kerma region. The gradual aridification of the climate causes populations to move towards the banks of the Nile. 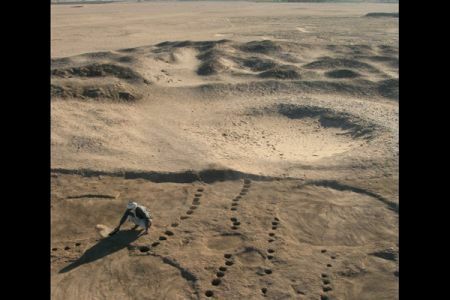 The remains of their settlements, now located in the cultivation zones, were mostly destroyed during the ploughing of the fields. 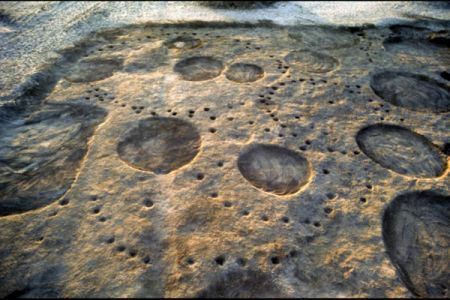 Although rare, evidence does exist; it is noted at the site of the eastern necropolis, where a vast agglomeration was revealed under the tumuli of the Kerma period. This agglomeration, discovered in the mid-1980s, covers one and half hectares, and corresponds to the permanent settlement of an agro-pastoral community. It comprises approximately 40 huts measuring between four and seven metres in diameter, which surround a storage area that includes almost 500 cereal granaries. Three buildings are noted for their rectangular shape. These appear to have served an administrative, religious or defensive function rather than a domestic one. Large animal pens delineated by wooden palisades and imposing fortifications developed on the outskirts of the settlement. These constructions already denote a certain degree of densification and complexification of the settlement, which in turn represent the emergence of a more complex society. Thus the Pre-Kerma people who settle along the Nile between 3500 and 2500 B.C. seek protection from outside threats and wish to safeguard their wealth within a vast and completely enclosed complex that must have covered tens of hectares. 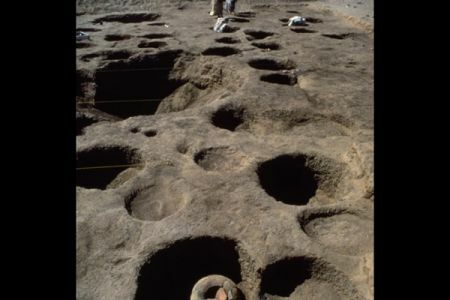 Archaeological data pertaining to this period are rather rare in Upper Nubia and it is rather difficult to highlight connections between Pre-Kerma people and their neighbours. We only know that contacts deepen throughout the Nile Valley and that Nubia’s riches—notably gold, ivory, ebony and cattle—are coveted by elites in the north. Trade increases between Lower Nubia, occupied by the A-Group, and Upper Egypt. 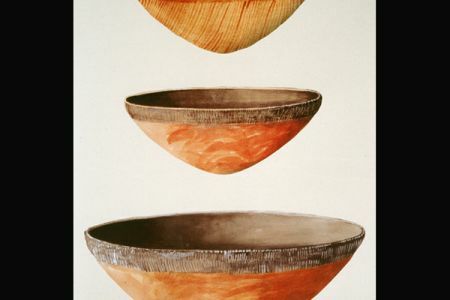 Upper Nubia was undoubtedly influenced by these interactions, but it remains difficult to ascertain its implication in Nilotic trade. 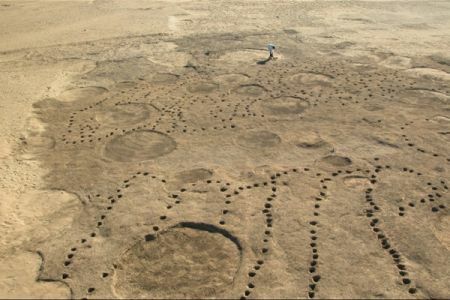 At the moment, because of the few Pre-Kerma settlement sites and the rarity of necropoleis, it is impossible to formulate a firm idea regarding the dynamism of this culture in the region.